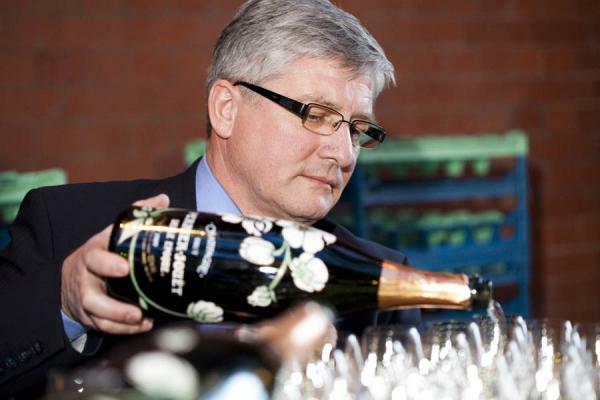 The Person: Herve Dechamps, seventh cellar master of Perrier-Jouet. Based in Épernay in Champagne, Perrier-Jouët was founded in 1811 by by Pierre-Nicolas-Marie Perrier and his wife, Adele Jouët. Current cellar master Herve Dechamps came to Perrier Jouet in 1983 and took over as cellar master in 1993. 1964 was the first vintage for Perrier Jouet’s signature luxury Cuvee Belle Epoque which, by some accounts, makes it the fifth luxury cuvee launched in Champagne. Currently, quality is at an all time high. Whether grown in the company’s own 266 acres of estate vineyards or purchased from other growers, the grapes for Perrier-Jouet’s Champagnes are pressed in the grand cru village of Cramant (in the Cote de Blancs) in Perrier-Jouët’s traditional wooden presses. After it’s racked, the clear juice is transported to Épernay for primary fermentation in stainless steel tanks. 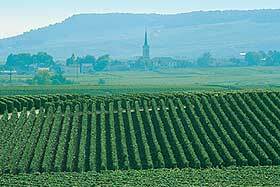 Champenization, aging en tirage, riddling, and disgorgement take place at the company’s cellars in Epernay. My history with Perrier-Jouet goes back to the early 1980s and my first wine wholesale job (as a salesman at Glazer’s) in the wine business. I was hanging with what then passed as the wine geek crowd. The Champagne sales pecking order back then was Moet & Chandon, Mumm, Perrier-Jouet, Taittinger, and Veuve Cliquot. Of those, PJ Grand Brut was the favorite of the geek crowd and PJ “Flower Bottle” (then properly “Fleur de Champagne” but now called “Belle Epoque”) was the darling in the luxury cuvee range. A lot has changed since then. Clicquot and Moet, now owned by the same company are one and two in terms of Brut NV sales at Spec’s. Perrier-Jouet is number three and Pannier (a value priced co-op Champagne) is fourth. Roederer is fifth and Andre Clouet sixth. Taittinger, Piper Heidsieck, Louis de Sacy, and Gosset, round out the top ten. Duvall Leroy is eleventh and Bollinger Special Cuvee comes in at twelve. Mumm has dropped to thirteen. Together, the first two sell more bottles than the next eleven combined. While now back at number three, between way-back-when and now, PJ Grand Brut had fallen off dramatically. It has now come back dramatically. What happened? I don’t really know why but I do know that at least to my perception, the quality of PJ slipped a bit in the late ‘80s / early ‘90s. Maybe they stayed the same and some of the others improved. Maybe my perception is flawed. Whatever the case, sales of Perrier-Jouet dropped off as other producers drew the buzz. And then a funny thing happened. Over the last several years, I would encounter Perrier Jouet Grand Brut at comparative tastings of grand marque Brut NV Champagne and it would show well, often coming in as the favorite of those tasting. PJ seemed to be coming back but it took sales a while to catch up with the increasing quality. Maybe the continuity of having the same cellarmaster in place since 1993 has had a positive affect on quality. Then I was invited (as the token retailer) to a sommelier-heavy tasting of luxury cuvee Champagnes where we tasted Dom Perignon, Taittinger Comtes de Champagne, Roederer Cristal, Krug, Clicquot La Grande Dame, and Perrier-Jouet Belle Epoque (with others) in a blind tasting. Perrier-Jouet Belle Epoque was the consensus first pick and won the tasting. It finished first on my card as well. When I look at wines in categories, I often have a wine that I’ve picked as my reference point for that class. For Cava, it’s Perelada Brut Reserva. For Cabernet Sauvignon, it’s Alexander Valley Vineyards. For Zinfandel, it was Seghesio Sonoma but is now Dry Creek Vineyards Heritage Vines. For Haut Medoc, my reference point is Ch. Pontoise Cabarrus. You get the idea. At this point, Perrier-Jouet Grand Brut has become my reference point for evaluating Brut NV Champagne. If you’re trying to sell me a Brut NV and it is going to cost more than PJ Grand Brut, it had better stack up. Not many do. And the same thing is true at the luxury cuvee level with Perrier Jouet Belle Epoque. A base blend of 40% Pinot Noir, 40% Pinot Meunier and 20% Chardonnay with 15% reserve wines from previous vintages finished brut with a dosage of 11 grams per liter (1.1% residual sugar). Straw in color. Dry, medium-light-bodied with fresh acidity. Fresh and toasty with ripe citrus, a bit of red fruit essence, and some tree fruit, some biscuity character, and something of a floral note. As always, it seems to be better than I remembered it. Pretty in the mouth. Quite tasty. BearScore: 92. A blend of 50% Pinot Noir, 25% Pinot Meunier, 25% Chardonnay with 15% of the cuvee made up of red wines. After Champenization and 5 years of age en triage, the wine is disgorged and dosed to 10 grams of sugar per liter (about 1%). Salmon-pink in color and fully sparkling; dry, medium-full-bodied with softly balanced (for a bubbly) acidity and light phenolics. Offers riper red fruit with just a touch of citrus along with a darker floral note, some earthy richness, and subtle toast. This is much more vinous (with a bit of red wine character) tasting than most Rosé Champagnes. Delicious; GREAT food Rosé. BearScore: 93+. A blend of 50% Chardonnay (from Cramant, Avize and Chouilly), 45% Pinot Noir (from Mailly, Verzy and Aÿ), and 5% Pinot Meunier (from Dizy). All the base wines for the Belle Epoque get full malolactic fermentation. After blending and bottling and the second fermentation, the wine spends six years on the lees (en tirage). Light-gold-straw in color and fully-sparkling; dry, medium-full-bodied with fresh acidity. Rich, toasty, deep, with lots of development but still elegant. Big mouthful of Champagne with ripe citrus and some tree fruit. More richness than expected. Lots of mouth feel. The floral, mineral, and toast notes are all in. Really delicious; great food Champagne. Soul satisfying. BearScore: 96.